Inspiration comes from everywhere. I had a plan for this month's Note Card Party, but then in church on Sunday, an image was shown on the screen and all my plans flew away. This one took a little preparation and good weather. I taught yesterday, so I prepared last night and hoped for a sunny morning. Wind flapped against the house most of the night and I wondered if Plan A would have to be resurrected in the likelihood of rain. How happy I was to see the sun this morning! Easter greetings in English and French. These were fun to do. The preparation involved writing the cards. And a box top so you know what you're getting! I'm looking forward to visiting at Vee's Party this afternoon - you're welcome to join in. Vee's new rules allow for new photos, not just ones previous published. This is a good thing, I think. What a good idea! These are fun and very clever. Happy Easter! Have a lovely week. Your writing on the note cards is perfect - I love the french touch! Wishing you and your family a happy Easter time. "The "signs of time ring out the news..." Remember that old song. 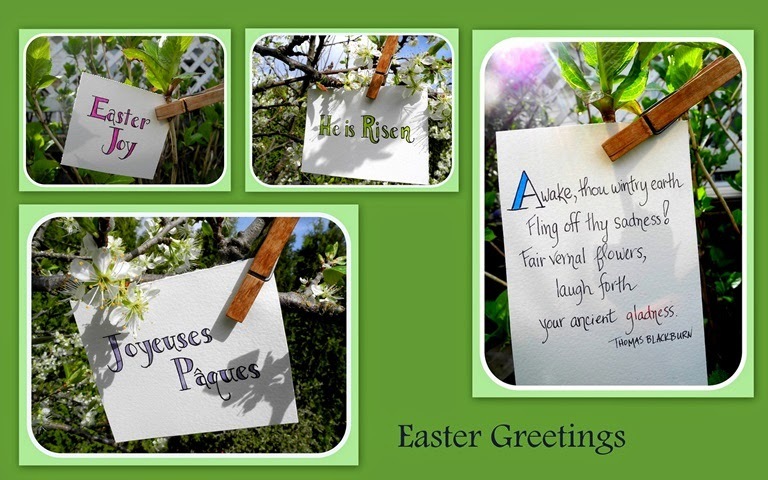 Well it came to mind when I saw the signs of your garden, and especially the HE IS RISEN....Beautiful set of Easter Cards. Clever, Lorrie and extra work to create those photos. Very creative and a good collective theme. Box them up! Love your inspiration Lorrie and the note cards are really beautifully done. Ah...so very clever. Beautifully done, of course. The collage brings it all together. Perfectly lovely. You have such original ideas. Oh what fun! Love your "notes" in your images. Super cute idea. Have a blessed Easter! Thanks for stopping by. Yes, hard to believe the things I started out housekeeping with are now considered vintage. O clever girl! (I do see why you had to break the rules. ) Will they be made up? I hope so! An absolutely beautiful idea, I am so glad the sun came out for you to capture their beauty! Thanks for sharing. Lorrie...what a darling idea! This is such great set of note cards! So glad the weather cooperated with your idea! Easter blessings! Lorrie, I love the theme and the pretty cards pinned throughout the garden. The text you created is awesome. Wow! You have come out of the box (no pun intended) with creativity for your note cards this month! They are beautiful, Lorrie! Love this! Wonderful news! He is Risen indeed! Your cards (back ground and written) are beautiful. Lovely! I like that first quote! What a lovely set of Easter cards! I too love your quote. Great idea and so well done. Lorrie - I love your idea for this month's cards, they really are beautiful. Love your penmanship/calligraphy also - and using the clothespins was a good idea. Busy week for you - hopefully some time to rest this coming Easter weekend. Love this idea, Lorrie . . . and your lettering is exquisite. What a great idea...so clever! I love these and I'll take a box please. Happy Easter to you! Clever, oh so clever! Love this idea. Bravo, and well done! What a lovely set of notecards. Beautiful thoughts for this season. Glad the sun cooperated for you! Sweet note cards, with lovely Easter greetings. I was just digging through supplies and came across my sketchbook from an online doodling class I took. I miss just sketching things on paper with colored pens. After seeing your cards, I am going to play today. We are total wimps and complaining because it is 64 degrees and too cold to be outdoors. I love these!! This is one of the best note card selections I've seen because it's so creative. It makes me want to copycat you! Nicely done. I would like any one of these as a note card. What a clever idea! I like the clothespin effect. These make great note cards. I like your idea to clip notes on the plants. Happy Easter! What perfect Easter note cards you've shared with us. Happy Easter blessings to you! I just LOVE your notecards, Lorrie!! VERY creative & beautifully done. BRAVO!! What a terrific idea! Love these! LOVE this!! Might have to do this with the Small One.